Do you have any emoji fans in your family? We do. My daughter will often want to use my phone to text extended family and she will type one sentence but then use like 20 emojis. She will giggle as she selects each one. It’s pretty funny. 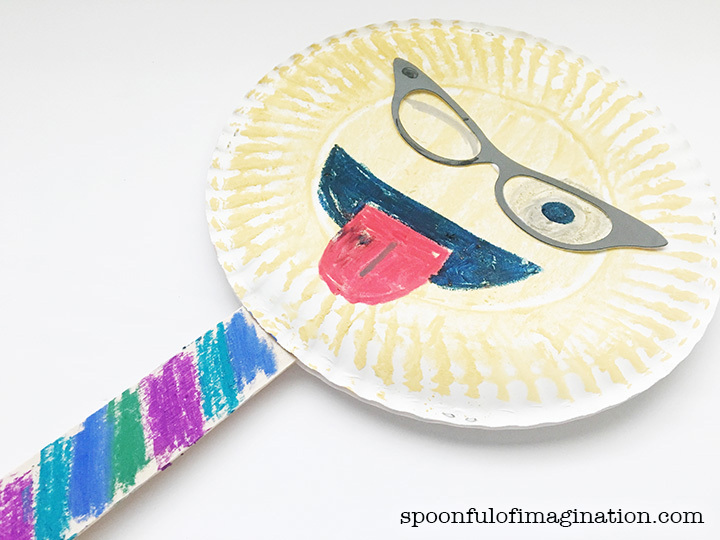 Today, we have a quick and easy craft for you to pull out for your emoji fan to enjoy! 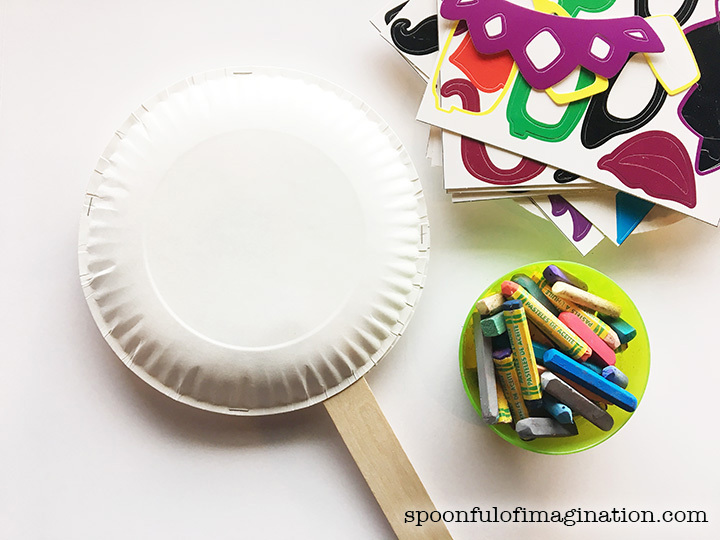 Use it as a party craft, as a life saver for a snowy day, or just for a fun weekend project. It’s low mess and sure to bring smiles! 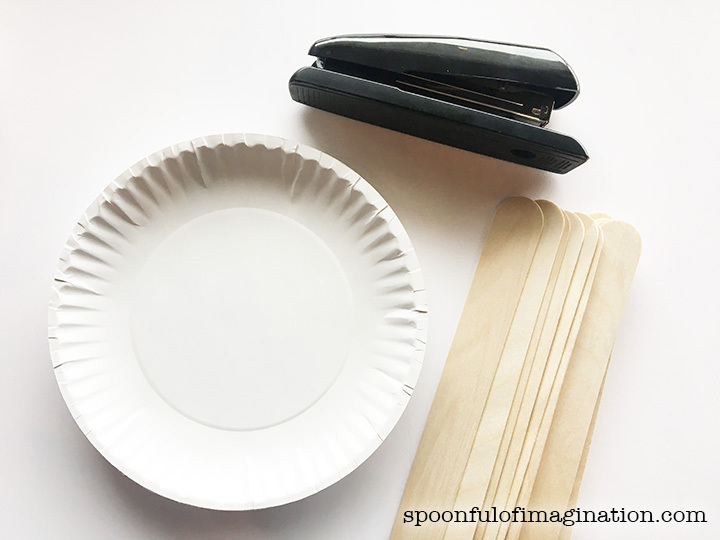 Grab a stack of paper plates, some craft sticks and a stapler to start. 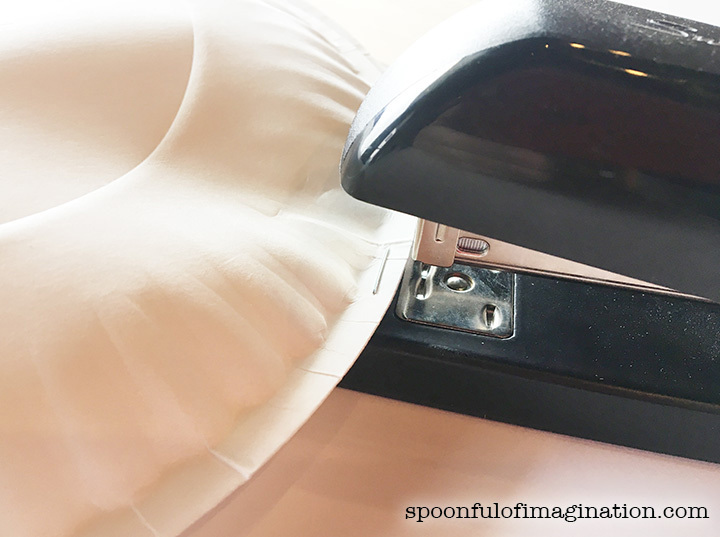 The first step is to turn one plate over on top of another and staple around the edges to attach the plates to one another. After you have a face form, I used a little hot glue to attach my craft stick inside the plates. 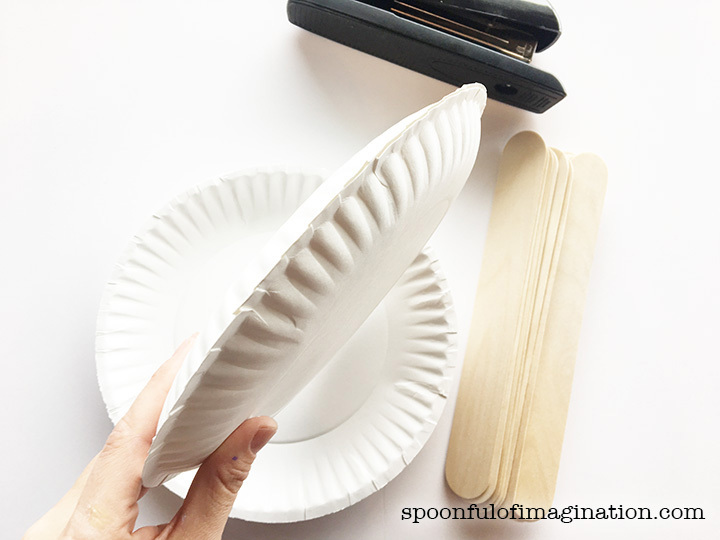 There was enough room between the stapled areas to stick a glob of glue on one of the plates, place a craft stick on top, and hold the sides of the plate together until the glue holds and hardens. After you have attached your stick, your emoji is ready to be created. This is where you can use whatever you have on hand! Markers, crayons, colored pencils, and even construction paper would be great tools to use to create your classic emoji face. We used pastels and leftover party photo booth cut outs (minus their stick) to create our faces. We placed all the tools out on the table and watched to see what inspired our artists and which face they created. It was so fun to see the artists laugh at one another’s creation as they guessed which face they were making. These were quickly used as puppets or props as kids talked and acted out little skits with them. 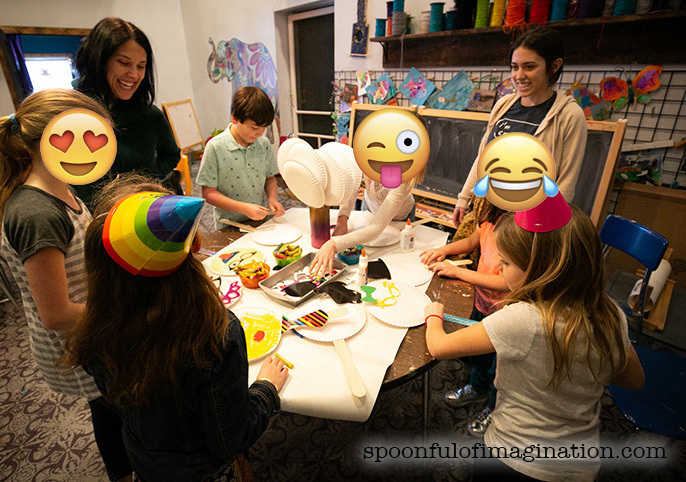 It’s a magical moment to watch a creation turn into inspiration for more fun! What do YOU think!? 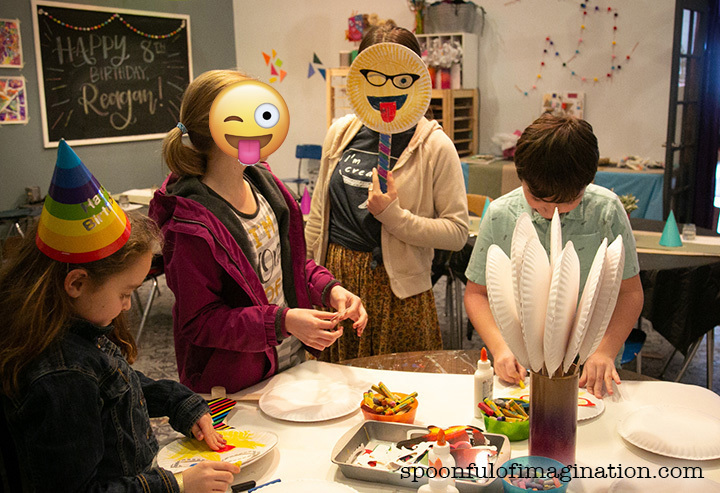 Will you make some emoji face puppets this week? 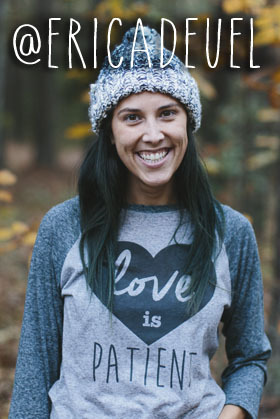 This is such a simple project that you can personalize however you want! Maybe you want to paint your face-that’s great too! Maybe you don’t have an emoji fan but you have an LOL Doll fan!? I’m sure you can take the idea of creating a face and turn it into an LOL doll. Maybe you add hair cut outs for your artists to glue on!? 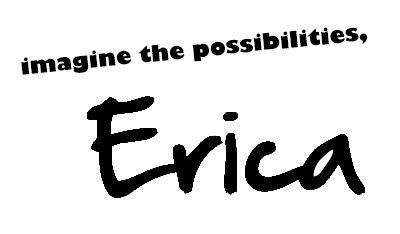 There are so many possibilities on how you can take this project and make it yours! Have fun! 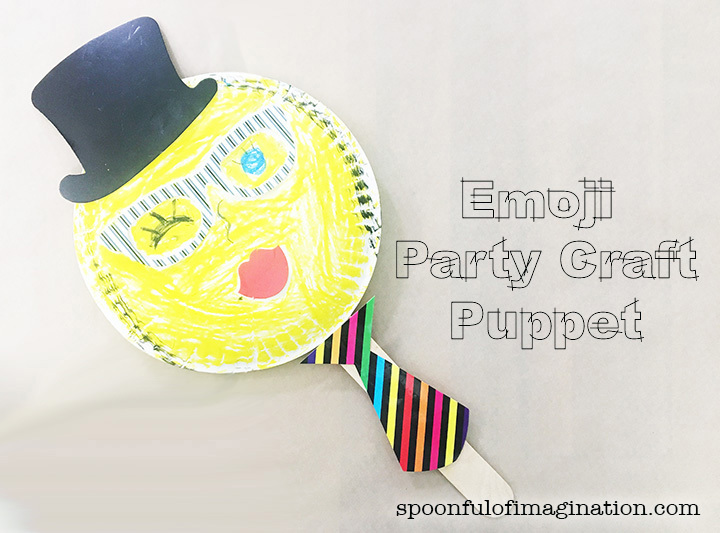 If you create some puppets, we would love to see! 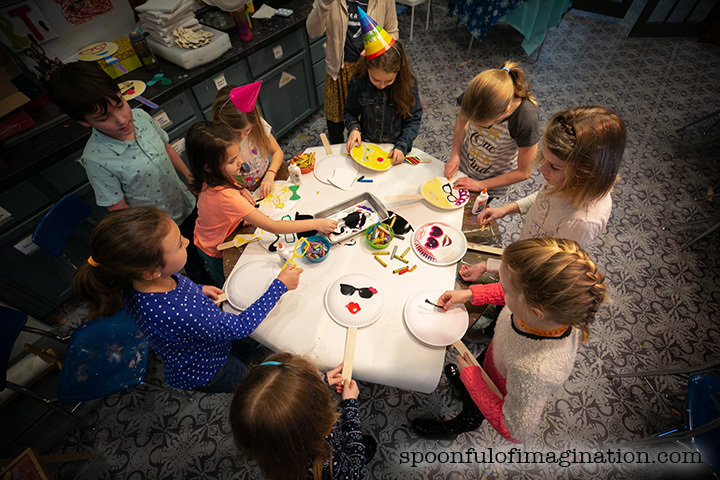 Tag us on social media with #spoonfulofimagination so we can see your masterpieces!